I was at one of my favorite locations to study—a Barnes and Noble just off of Rockville Pike—and by chance I had the pleasure of getting to know a very talented artist. 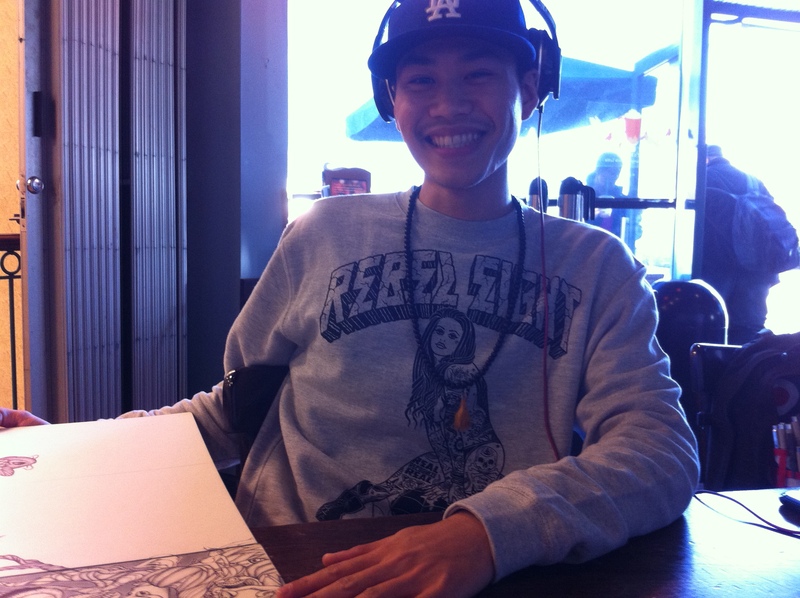 Meet Henley Bounkhong, self-proclaimed and self-taught freestyle artist and definitely a creative sensation. I was a little hesitant to approach him at first; the headphones he was wearing seemed to say to me, “Do not disturb!” If you take a look at his art though, I’m sure you can understand why I could not pass this opportunity by. CEC: Hi! I couldn’t help but notice what you’re working on there, and I think it looks amazing. I was wondering, would you mind if I interviewed you for my blog? HB: [Smiles.] Sure! No problem. CEC: Thanks! Would you mind telling me a bit about that piece you’re working on there? HB: Sure. This is actually a continuation of something else I’ve been working on—here, let me show you. [Pulls out a second board from underneath the one he is working on.] This was the first one I finished several months ago. I showed it to a few illustrators; one of them told me it looked a little incomplete. CEC: Really? Why did he say that? HB: Well, he said it looks incomplete because of all the black space on this side. [He motions to the black area.] So I decided to add 8 more boards to it making it into a 9-piece set but keeping the black border going all around as if it was in outer space. [Points again to the piece he’s showing me now.] This one belongs in the middle-left. The one I’m working on right now goes on top. [He pulls out another sketch board.] And this one goes on the bottom. CEC: Wow! All of this looks amazing! So how long have you been making art? When did you start drawing, or learn that you loved to draw? Did you ever take lessons? HB: I’ve always been drawing since I was younger, and I never stopped. I’ve never taken any classes; everything I make comes from my own imagination. I started doing these bigger pieces about a year and a half ago; before that, I did most of my drawing in sketchbooks. I also used to do tattoos, but I decided that wasn’t really my passion because with tattoos, there’s some limitations and I am only able to create my best works of art within absolute freedom. That’s where creativity lives-within pure & absolute freedom. CEC: So what got you started on the bigger pieces? HB: I started making these larger sketches about a year and a half ago. I work at this diner in Bethesda, and one day I just started drawing this koi fish. A couple came in and the husband and wife really liked the koi fish I was drawing in my sketchbook; the wife whispered to her husband if he thought I would sell it, and the man said that he didn’t think I would. The next day, the husband came in again—at first I thought he was looking to buy more soup or something. [He laughs.] But he actually came to ask me about a commissioned work for our anniversary, and I said yes. He told me his wife loved the koi fish I was sketching the other night. I immediately envisioned two koi fishes, a male & a female, swimming upstream with a cherry blossom tree on one side, a peony, lotus, and an undying rose representing undying love, peony for beauty, a lotus for enlightenment. Their anniversary was 2 weeks from the day he requested a commission. I didn’t finish it in time for their anniversary, but they loved it anyway and they still have it hanging up in their house. Ever since then I’ve been making these 15x20s. CEC: That’s great! So does this project have a name yet? HB: Oh. [He laughs.] No, I don’t have one for this yet; it’s untitled for now. CEC: I see. So where do you get the inspiration for your artwork? HB: Most of my inspiration comes from music. I prefer listening to beats, instrumentals, chill out tunes, jazzy, downtempo, lyricless- basically anything with little to no words. To me, words are just distracting. In order to allow yourself to manifest original and creative thoughts you have to get use to emptiness of the mind. I use the beats as my canvas; they create the atmosphere of my imagination during that time. So whatever the music sounds like to me I picture the feel of the art along with it. The sketches I make are like the words to the instrumentals; my board is the music sheet, and my pen ink writes the story. Also, my art is completely freestyled; I don’t plan what I draw ahead of time, it just flows out naturally. CEC: So where do usually work on your stuff? HB: I usually do my work here, at this Starbucks, about 2-3 times a week. CEC: Have you started to put your work out there yet? HB: I have. I’ve gotten the attention of at least a few curators. I’m not sure where or when I’m going to showcase anything yet though. I was told by one curator that they would like to see at least 20 to 25 original works, so I’m in the middle of completing all of that now; I’ve made about 14 or 15 finished ones so far. CEC: That’s fantastic. Well Henley, thanks very much for taking the time to interview with me; I’ll be sure to get back in touch with you for a follow-up. Best of luck to you, and stay in touch! Let me know if anything interesting pops up for you that you’d like me to write about in the future. HB: Sure, no problem! It was nice meeting you, and thanks for helping me out, I appreciate it. CEC: Of course! I love anything related to the arts, and I’m more than happy to help promote someone’s awesome work. It was nice meeting you as well! I could have talked to this artist all night. Unfortunately, I had plans with a friend that I had to go to, so I had to cut the spontaneous interview there. This guy is talented, friendly, and very open about sharing his work. If you ever get the chance to see him in action, I’m sure he wouldn’t mind if you said hello. Remember though, he is an artist, so please be courteous and avoid distracting him if it seems like he’s deep in concentration over his work! Before I wrap this entry up, I did get a chance to do some follow-up with Henley via email, so here’s a little more about this artist, for those that are curious. CEC: What is your nationality? HB: Laos with a hint of Chinese. CEC: Do you have any artist inspirations? HB: Artists that inspire me are Greg “Craola” Simkins. 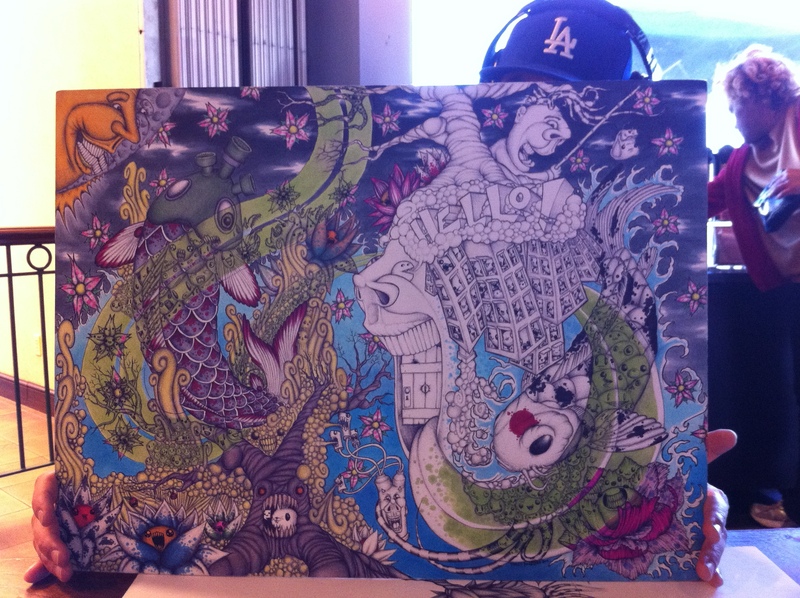 Shohei Otomo, Nanami Cowdroy, Mike Giant, Paul Booth, & Kore Flatmo. CEC: What is the first thing you remember drawing? HB: Well, the first thing I remember drawing was an uneasy circle. Actually, it was the first time I had ever picked up a crayon, a blue crayon. I was probably around 2 or 3 years old and I grabbed it, put it against the wall of my room, and did a circular motion with my arm. Just to see this line manifest after an effortless natural movement that spurred out of curiosity amazed me for some reason. So I did more scribbling on the walls, then my mom spanked me, but it never stopped me from creating. CEC: What is a piece you are most proud of? HB: A piece that I’m most proud of would be my version of Hokusai’s The Great Wave, where I have replaced the water with thousands of striped tentacles, made a DJin’ octopus tower over Mt. Fuji, placed a happy moon in the night sky, and put some bears in the ocean along with lotuses and buddha. It took me really, really long to shade in all the tentacles that made up the fury ocean since all I used is a regular ballpoint pen to shade it all in. But it was all worth it, it came out beautiful. CEC: How can people find out more about you? HB: They can like my art page on Facebook if they searched for Golden Rabbit Silent Monkey. Also on Facebook is another page called imposter, which is the name of the brand my cousin & I are coming up for t-shirts, artwork, stickers, etc. I have a Tumblr page: http://rastrophiliopustrocity.tumblr.com/ . I like to post my works and thoughts there also. CEC: Is this something you can see yourself doing for the rest of your life? Where do you hope to bein 5 years? 10 years? HB: It’s what I’ve been doing all of my life, and I won’t stop until my breathing stops. I love creating my original works of art and I will be doing it for the rest of my life whether people will buy it or not. It makes me feel alive, it helps me relieve pain that dwells in the soul, it makes me the most happiest, it draws curiosity and attracts attention, it’s a whole new world of imagination that I believe only I can bring to existence in my own unique ways. HB: In 5 five years, I can see myself still creating my works of art the way I do, but doing it full-time, some still at Starbucks, most at my own art studio, just always getting myself prepared for another art show of mine. I can see myself having more time to experiment with other mediums on my own If I ever do have an art exhibition within the next 2 years since I know that people will know what I’m about after viewing my works, I’m going to switch it up and change every show. And as for the next 10 years, I can see imposter!, my clothing company, grow bigger and providing not only tees, hoodies, sweatshirts, etc., but something to feed your imagination to remind ourselves that no matter what occupation you hold or however old you think you are, that we’re all still a wild child inside. I got to talk to a DJ that same afternoon as well, so stay keep your eyes peeled for another interview which should come about sometime during the next few days. ← The Creative Buzz: Stay tuned for upcoming updates!